As I noted, NBC's Sunday Night with Megan Kelly broadcast a story earlier this month about Boys Latin Charter School, a "successful" charter school in Philadelphia which claims to have ten times the college completion rate of its neighboring high schools. First, and as I documented in the last post, Boys Latin raises funds outside of the monies it collects from public sources. The amounts add up to thousands of dollars per pupil per year. As Bruce Baker notes in this (somewhat snarky) post, you really can't make a comparison between two schools and call one "successful" without taking into account the differences in resources available to both. 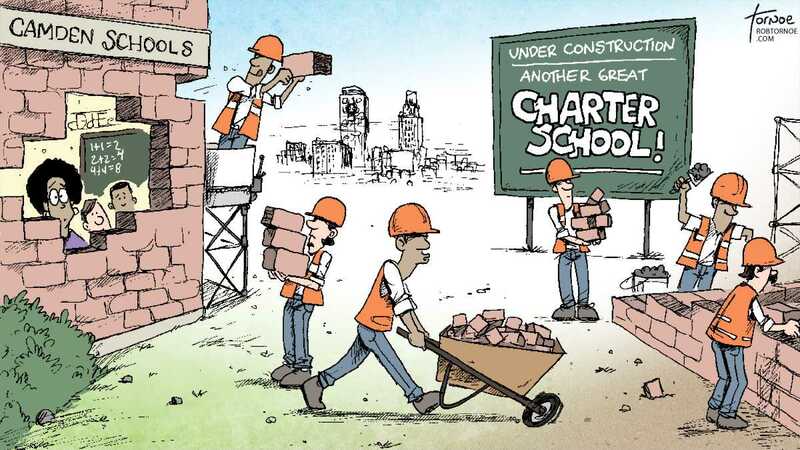 Philadelphia's public school district has been chronically underfunded for years. It's hardly fair for Boys Latin to collect millions in extra revenue, then brag about their college persistence rate compared to schools that don't have enough funding to provide an adequate education. Hypothetically speaking, say a charter school is authorized to serve up to 500 students, but, for whatever reason, 50 students leave through the course of a school year. A charter that "backfills" will enroll the next 50 kids on its wait list as space becomes available. Other schools will replace those empty spots at the beginning of the next school year, including filling seats in the upper grades. Charters that don't do this will watch their total enrollment in a grade dwindle year by year — retaining only the students tenacious enough to persist. In contrast, district-run neighborhood schools and renaissance charters must enroll all students living within a prescribed catchment zone, no matter what time of year or grade, when they show up asking for a seat. At first glance this difference may seem a subtle nuance, but Philadelphia educators say the policy difference tremendously affects school culture and performance. David Hardy, CEO of Boys' Latin, subscribes to the same theory. He oversees a rigorous admissions process that begins well before the school year. Boys' Latin asks prospective ninth-graders to submit letters of intent in November, nearly a year before they would enroll. Staff then interview students and parents to ensure that they understand the school's rigor -- classes run until 5 p.m., students must learn Latin, wear a uniform, and adhere to a strict code of conduct. Those who commit attend a month-long freshman academy in July before the school-year-proper begins. By September, he said, the kids are all on the same page. This is an issue that comes up over and over again in charter school research: student cohort attrition. As a cohort of students (Class of "x") moves from freshman to sophomore to junior to senior year, it may lose students. Sometimes students drop out; sometimes they move. If a charter school "backfills," they then replace the students who left with new students who come into the school in later years. Many charters have high student cohort attrition rates, meaning students leave the school before graduation -- often returning to the public, district schools, which must take them no matter when they arrive at the schoolhouse door. These same charters don't backfill, so their cohort sizes shrink as they move toward their senior years. 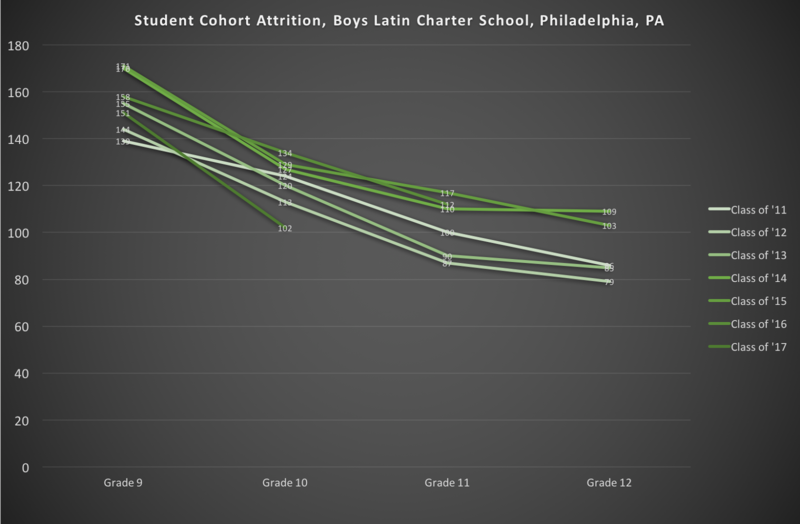 What are the patterns of cohort attrition for Boys Latin? This is based on federal data as reported in our School Funding Fairness Data System. Each cohort or "class" at Boys Latin is tracked as it moves from freshman to senior year. 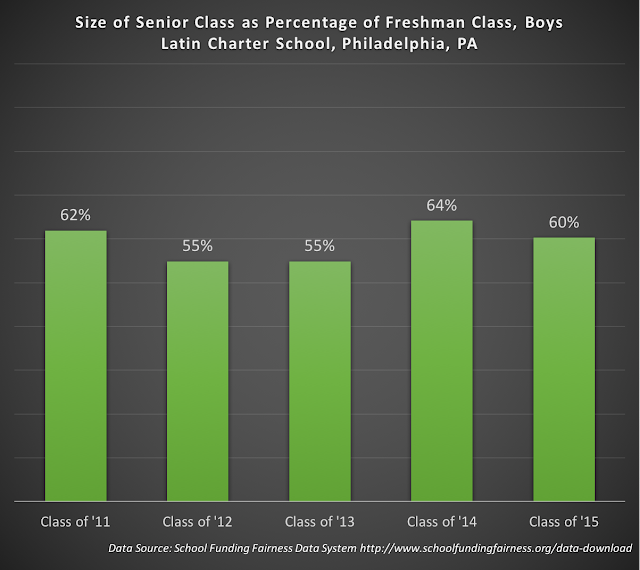 Every year, Boys Latin loses at least one-third of its students, and never replaces them. So why do kids leave? "Normally it's because a student doesn't want to take the volume of the work that we do," said Hardy. And when that happens, "there's a mechanism to kind of go after them." At Boys' Latin, this process includes tutoring, probation, and Saturday school. "If the student makes the decision that they really don't want to do the work, then what's the point?" Hardy said. "That normally is a family decision. They say, 'Why keep him in a school that he really doesn't want to be in?' That's the beautiful thing about school choice." Hardy says his school doesn't actively push kids away. "You can stay here and fail," he said. "But that doesn't make sense, does it?" OK -- Why, then, would you ever make a comparison in your college completion rates to neighboring high schools? I'll give Hardy this: he's at least more intellectually consistent than Steve Perry, who can't get his story about "ham shaving" straight. But can we at least acknowledge a few things? - It's a lot easier to have high college acceptance and persistence rates when you don't have to educate everyone who shows up on your front steps. - It's a lot easier to have high college acceptance and persistence rates when kids who can't cut it in your program decide it's a "beautiful thing" to leave. - Why does a school like Boys Latin, which skims the cream, get all sorts of extra funding while the Philadelphia public schools, which must educate everyone, remain chronically underfunded? I have no doubt the staff of Boys Latin is full of dedicated, caring professionals who are working hard every day to give their students a great education. But I see very little in their model that could be scaled up. Jersey Jazzman is the pseudonym for Mark Weber, a New Jersey public school teacher and parent. Weber is also a doctoral student at Rutgers University in Education Theory, Organization, and Policy.